Is the corporatization of Justification the disintegration of a good bottle of wine? Justin’s new patio overlooking their vineyards. Some say yes, especially the folks working in competing Paso Robles wine tasting rooms. Many suggest this California beauty will degenerate with increased production goals of Justin’s new corporate owner, Roll Global. As reported in the San Luis Obispo Tribune, they quote Justin’s vice president of marketing saying they want to, “go north of 200,000 cases produced annually … on the back of cabernet sauvignon, but also chardonnay and sauvignon blanc.” In 2013 they produced 120,000 cases, 80,000 shy of their goal. Let’s start at the beginning of the story. Before our first journey to Paso Robles we queried friends for their Paso wine tasting suggestions. Justin Winery topped everybody’s list. On our journey there, winding down Chimney Rock Road, miles from a gas station (on our last quarter tank) we wondered how popular this place could be, or how people could even find it buried in the far reaches and deep canyons of Western Paso Robles. 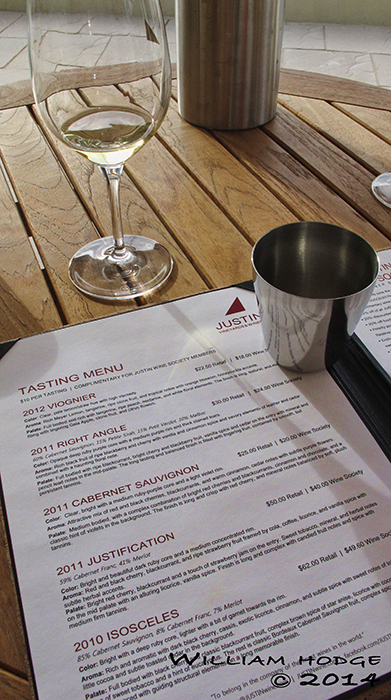 Stainless steel spitting cups are a welcome addition to their tasting experience. Our answer was a full parking lot and a tasty and bountiful flight of wines. It was one of the first wineries we tasted with flavor, fruit and beauty throughout their flight. When wine tasting you must often kiss a lot of ugly frogs before you find your true prince or princess. Every one of their wines was a prince or princess, no ugly frogs here. Fast forward many years and a divorce breaks up the family, some say, forcing the winery’s sale. In swoops Stewart & Lynda Resnick of Roll Global (owners of Fiji Water) who buy the winery for a reported $21million in December of 2010. Over the last three years we’ve watched and waited to see what changes would occur. We saw nothing negative, only positive. 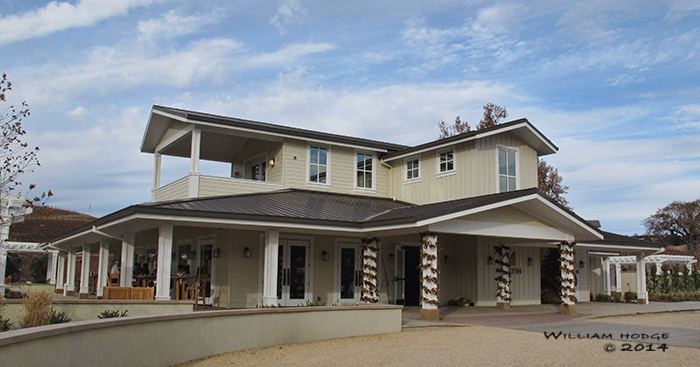 They rebuilt their tasting room, offered stainless steel spitting cups, created a large patio, added hotel like rooms for overnight stays, gave employees 401k plans and kept the winery’s founder, Justin Baldwin, onboard. But something has changed. They fell in love with their Merlot, informing us they are so in love with their Merlot they are blending more into their wines….in particular Justification. Justin’s rebuilt tasting room facility. Or, is this a way to increase bottle production? According to one of their publicists, the answer is no, their bottle count has not increased. Stephen Schmitz of Calhoun & Company Communications, tells us they produced 3,500 cases of Justification in 2009 & 2010 the last years of private ownership. In the first harvest of the new owners, the 2011 we tasted, they still produced 3,500 cases of Justification with an expanded blend of Merlot. While those numbers tell us no, they’re not expanding production, we’re still not enjoying this wine as much as in the past. Can more Merlot change a blended wine’s character, even if it’s only 5% more? Well, it did change for us. 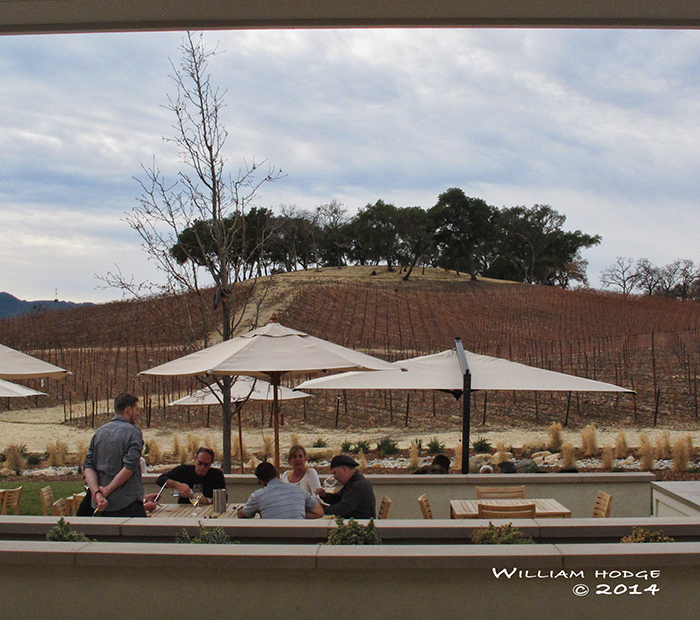 While tasting their 2011 Justification, sitting within their beautiful newly built patio, it was clear the wine was different, not the wine of past years. And, certainly a bottle of wine requiring bottle aging. Here are the hard numbers about the blend, the added Merlot. Is the 2011 a better bottle of wine? We think not. We hope this isn’t an attempt to bolster profitability by blending in more of a less interesting grape. A ✰++ is the true measure of our wine enjoyment, the ranking where we pull credit cards from our wallet and tally up the bill. We did not find a single compelling wine like we did on our first visit. If we started with a clean slate, visiting for the first time, looking for a good, interesting bottle of wine, our notes suggest Justin would be just another winery among hundreds churning out Paso Robles wine. This was not the case years ago during our first visit. We fell in love with their bottles of wine, but not so during this visit. Let’s hope they can stay the course, pay the bills and generate profit by increasing quantities, while creating an interesting bottle of wine, like Justin produced in the past. This entry was posted in Cabernet Sauvignon, California Wineries - New World Wines, Chardonnay, Coastal Valley Trail - NW Quadrant, Merlot, Paso Robles AVA, Tasting Room Etiquite, The Pleasures of Tasting Wine, Thoughts About Wine - Exploding Ruby Flowers On Your Palette, Viognier and tagged bottle, bottle of wine, california, fiji, justification, justin, paso robles.